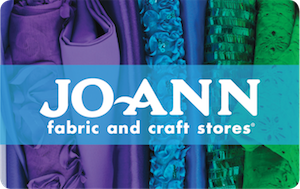 Whether you’re a seamstress or a craft enthusiast, a discounted Jo-Ann gift card will save you money on the supplies you need. Don’t have a project in mind? No problem- trip to this store will surely inspire you in the direction of your next creative endeavor. And with your discounted card in tow, you will pay less money for everything you buy! From beautiful fabrics of every kind to jewelry making, your dollar will stretch farther than it ever has before! What started in Cleveland, Ohio in 1943 by German immigrants, today there are over 800 stores located in 49 states. One of the many great things about gift cards is they are as good as actual money. With this in mine, you can use your discounted Jo-Ann gift card at any of these locations, anytime you, please. Buy something today and save the remaining balance for holiday decorating and all the while you will save money! So why should you wait any longer? Buy your discounted card today and get your craft on! Although a Jo-Ann gift card purchased at a discount will save money on all your sewing and crafting needs, the savings don’t have to end there! Be sure to check out their store flyer for additional savings such as 50% off any one regular priced item or 60% off holiday décor. And in a store full of creative goodies, these savings are incredible! Just think about all the beautiful fabric and sewing supplies you can purchase. And that’s not all. They carry yarn & needle arts, paper crafting, art supplies, baking & party, floral, and even home décor! Finally, you can shop in the store you love while saving money! Purchase your Jo-Ann gift card today and start saving money on all your sewing and artistic supplies! From fabrics to paper crafts and everything between, this is a creative soul’s dream store! And if you would like to save money in other favorite retail stores, be sure to check out our listings for Michaels, Hobby Lobby, A.C. Moore, Hobby Town USA, and more! Cards2Cash offers you lots of significant savings on the very same stores you know and love! Sell Cards2Cash a gift card! Do you have a Jo-Ann gift card you will never use? Sell it to Cards2Cash and put money in your wallet! We buy a variety of gift cards for retail stores and restaurants! And what’s more, we pay a high percentage rate for them! If interested, visit one of our retail locations for immediate payment for your unwanted card, OR fill out our online form and we’ll get back to you with an offer you won’t refuse! Cards2Cash is your one-stop gift card shop!